Recently, I was lamenting our financial situation to a good friend. I just had a dental procedure at a periodontist, I was just told my 6 year old has 8 cavities (that’s another story) that will cost $400 out of pocket to fill, and that my 10.5 year old will need braces to the tune of $5,000 or so. Add on top of that the fact that our car has 150,000 miles on it, and we refuse to borrow for a new one, and well, I’m looking at a lot of financial stress. Still, these expenses don’t have to be paid immediately. I’m saving money every month for a new-to-us car when our old one finally gives out. I may be able to wait a bit to get my son braces. I just wanted to vent a bit to my friend and express my frustration. I was really surprised by her answer. She simply couldn’t understand why we would contribute to our retirement when we have so many impending expenses. There’s no good time to save for retirement. You could always use the money for something else. When my husband and I were newly married 14 years ago, I made a little over $30,000 a year. We lived in the suburbs of Chicago, which wasn’t cheap. My husband was a graduate student and didn’t work. We were flat out broke. And my employer had a mandatory rule that 8% of my gross income would go to my retirement savings. I HATED that rule. There were so many other things that I could have used that money for, but I had no choice. 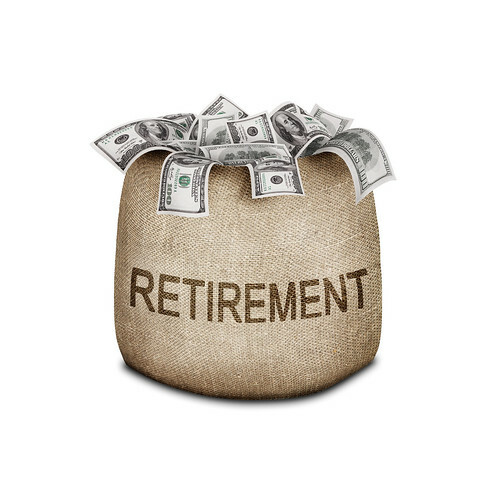 Eleven years later, when I left the job and walked away with 11 years of retirement savings at 8% of my gross salary plus an equal match by my employer, I was ecstatic that I was forced to save for retirement. Now, my husband is working for an employer who has the same rule, and we’re happy that 8% of his gross salary goes to his retirement account. We’ve learned our lesson so well, in fact, we are also contributing to our Roth IRA even though money right now is T-I-G-H-T. But really, for most Americans, money is almost always tight. I would rather scrimp and save now, while we still have many working years left before retirement than scrimp and save during retirement, constantly worrying if I had enough money to last me until the end of my life. 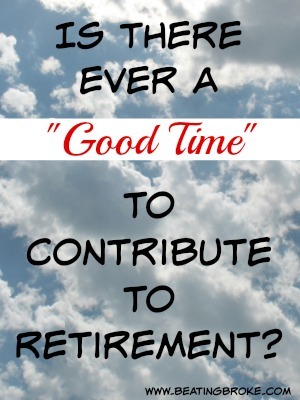 So, no, my well-intentioned friend, I don’t think I should stop contributing to my retirement. In fact, there’s no better time than now to save for retirement. Do you continue to contribute to your retirement when facing large expenses, or do you wait to contribute until your finances improve? I’ve been going back and forth with myself over whether I should write a post about how I am withdrawing money from an IRA. It’s not something that is recommended, and certainly not something that most people who write personal finance blogs talks about. In fact, it’s somewhat embarrassing that I am doing it at all. And, I had decided that I might not talk about it. Until I saw this post on my friend Sandy’s blog, Yes, I am Cheap. For those of you who won’t click through the link, I’ll give you the quick rundown. One of Sandy’s readers lost her job a while back. Since then, the reader has used all of her savings to pay bills, and her unemployment status is in a sort of limbo. The reader has 21k in her 401(k), and she asked if she should take that money out to help pay the bills until she can find work. What that post did for me, and the reason that I’m writing this post, is remind me that I’m not an island in the personal finance ocean. When I started this blog, I didn’t have a 401(k), or really even know what one was. I was up to my eyeballs in debt, and contemplating bankruptcy. As I searched the internet for information about that and other personal finance related topics, I decided that I wanted to share what I was learning, in an effort to help others who might be in a similar situation. Sometimes, when writing post after post, here, I forget that I’m not the only one who has the same questions, or who is in the same situation. There are other people who’s circumstances might make them cringe when bills show up at the door. It’s for those people that I write here and share here. And it’s for those people that I am writing this post. I think this may be the longest introduction to a post I’ve ever written. 🙂 Let’s get on with it, shall we? Those of you who are regular readers will recall that I quit my job in November of 2011. It was a decision that I had been coming to for many months, and a decision whose timetable was advanced by several situations at that job. All of those situations made it very unhealthy for me to be there anymore. So, I quit. I didn’t do much planning, and hadn’t done much saving. I had to quickly cancel the mortgage paperwork we had been trying to push through as we wouldn’t be able to afford the house we had been planning to buy. All in all, it wasn’t the greatest idea, financially. Emotionally and mentally, it was the best idea I’d had in a long time. I then spent about 7 months working part time while trying to rapidly build my blogs, here and elsewhere, to a point where they might sustain my without having to get another full time job. I didn’t succeed. And I ran out of savings about a week and a half after I had taken a new full time job. It’s a good job, and I enjoy it quite a bit. But, it doesn’t pay nearly as much as my other job had. When I started there, our finances were still bleeding. They continued to as we continued to try and make ends meet. Sometime last fall, it became apparent that the ends were going to begin to not meet. If you’ve ever been there, you know that looking forward to a month where you might have to decide which bills to go delinquent on isn’t a very comfortable spot to be in. It became very apparent, after several hours going over our budget, that we had a cash flow issue. Too much going out, not enough going in. The problem wasn’t with discretionary spending, however, although we did find some places to cut there too. The problem was that we had too many payments taking up too much money. If we wanted to survive, financially, we needed to find a cash flow solution. I should say that it wasn’t an easy decision to tap into my IRA. At the time, I’d only recently rolled my 401(k) from my old job into it, so I’d just taken a hit by doing that. But, I needed a way to create some cash flow, and an infusion of money would do it. So, I called my adviser and had him issue a check for the amount I needed. There will surely be a few naysayers who come upon this post. Most of them will tell me (and you) that what I did was a terrible thing to do. That I’ve permanently set myself back for retirement, and that there had to be other ways to accomplish the same thing. But, there weren’t. Trust me when I say that I know my finances. Yes, it will set my retirement saving back by quite a bit. Yes, I’ll have to save more in the future to achieve any sort of retirement nest egg. I know all that. But, I feel that remaining current on my bills, and not having to potentially declare bankruptcy is more important than that. For those of you who are thinking to yourselves that if I made a withdrawal from my IRA, it’s ok for you to do it too, just stop. This was a last ditch effort to stop us from going into delinquency on several accounts. Would it have bankrupted us eventually? Maybe. I’ll never know, and I didn’t want to find out. But, what I will tell you is it took a good deal of thought to make the decision, and it took a good deal of determination to use the money properly when I did get it. When the check arrived, I cashed it and went to the casino. Just kidding! Ya’ll were looking so dang serious! I deposited it. Directly into our checking account. During the decision process, I’d taken a full audit of our bills each month and determined the ones we would need to, and could, eliminate in order to get ourselves back on the right track. So, even before I asked for the withdrawal from my IRA, I had a list of the things that I was going to pay off. Over the next several weeks, as those bills came in, I send them payment in full. Until all but one of them was completely paid off. The one remaining was a bonus bill. I didn’t have enough to pay it off in full, but was hoping that I could get them to negotiate the amount down. I wasn’t able to. So we still have that payment. But, once it was done, we eliminated several hundred dollars worth of monthly payments. More importantly, we cut our monthly payments by enough that we have enough each month to pay the remaining bills while still having enough left over to pay a bit extra. We’re on the right track again, and making strides to keep it that way. Would you withdraw from your IRA? There are only a handful of reasons that most people will tell you that making a withdrawal from an IRA is a good idea. Most of them involve exemptions from the tax penalty. 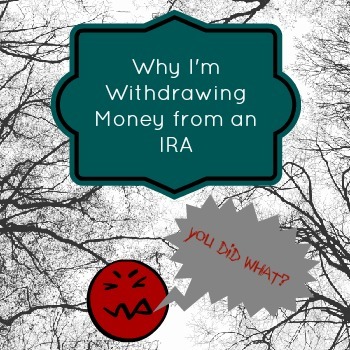 Would you ever take a withdrawal from your IRA? In my situation? In any situation? Retirement can sometimes be like that one cousin at family gatherings. The one that nobody likes to talk about. I think that, like that cousin, it’s easier to put our retirements out of our minds simply because, for many of us, it’s still so far away. We’ve still got 10, 20, 30, or even 40+ years before we hit that golden age of 65.5 and start living the good life of retirement. Naturally, our nearer goals are at the front of our minds and take up most of our thoughts. After all, which are you more likely to worry about? Your upcoming performance evaluation next week, or your retirement in 35 years? Retirement never stood a chance. But, like that cousin, you’ve got to think about your retirement sooner or later. And, the sooner you start thinking about it, and preparing for it, the better off you’ll be when it comes time to face it. In fact, the sooner you start saving for retirement, the better off you’ll be. Not only will you have to save less because of the wonders of compounding returns, but you’ll have more to show for it when it comes time to retire. At an average of 7% return, any money that you save for retirement will double every 10 years. What does that mean? If you wait an extra 10 years to start saving for retirement, you’ll have effectively cut your retirement fund in half, and will need to either drastically increase the amount you’re saving each month, or learn to live on less in retirement. Saving for your retirement doesn’t have to be complicated either. Sometimes, it’s downright easy! How do you make the most of your early retirement saving? Stop leaving it on the table. Get active with your savings. Go beyond being active, and be pro-active. Start with your employer. If you’ve got a 401(k) through your employer, take advantage of it. Contribute up to the full amount that your employer will match. Your HR department will help you get it set up, and give you the information on the match so that you can do that. Most 401(k) programs will have a set of target date funds that can be used to effectively set your 401(k) on autopilot. If you don’t want to be involved in the choosing of funds for the money to go into, the target date funds can be a great choice. Once you’ve gotten the full match from your employer in your 401(k), you might want to look into a private pension plan or an IRA as well. For most, the Roth IRA, with it’s tax free growth and withdrawals is probably the right choice. If you’re under 50, you can contribute up to $5,000 every year into an IRA. Use your tax refund, if you get one, to give yourself a boost each year on meeting that $5,000 limit. If you’ve still got more retirement saving to do after you’ve met the contribution limit, you can up your deduction into your 401(k). If you need more help with your retirement, or help figuring out what, how much, and when to save, find yourself a retirement expert. Your CPA or a certified financial planner should be able to give you a detailed plan for your retirement savings. The most important thing you have to remember with all this retirement talk is that if you don’t save, you won’t have any retirement funds to worry about. Unless you want to count on Social Security to fund your retirement. I’ve seen people who have done that. You don’t want to be in their shoes. Get your retirement saving started today. It really is important. Even more than that performance evaluation.